While in Paris, Eastside Burgers showed us that you donâ€™t need beef to make a tasty burger. 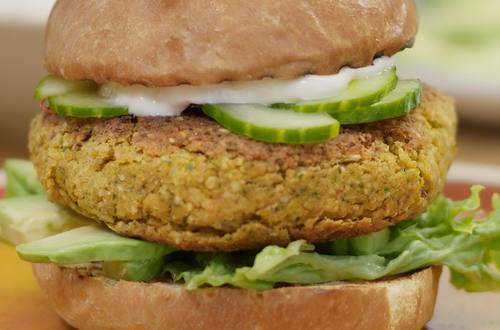 So hereâ€™s a veggie burger that tastes like summertime. 1 For the patty put all the ingredients except oatmeal in a blender or food processor and blend well. 2 Stir the oatmeal in and leave to rest for about 15 minutes. 3 Form patties of chickpea mixture, and fry them in oil for about 4-5 minutes on each side. 4 The saffron pickles are made by cutting the cucumber into thin slices and place them in a bowl. 5 Add sugar, saffron, vinegar, water and salt in a saucepan and boil it all up - pour over cucumber slices, and let them soak for about 1 hour. 6 Cut the avocado into thin slices and shred the lettuce. 7 Stir Hellmann's Mayonnaise with chili. 8 The burgers are assembled, so there's mayonnaise, lettuce, cucumber, avocado and the patty in all of them and arranged on a large dish - served immediately.